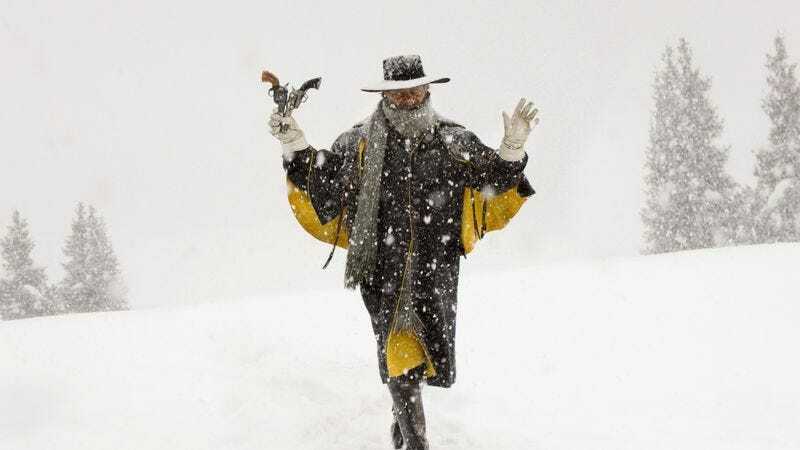 According to a new report by Deadline, the release of the 35mm and digital versions of The Hateful Eight will be moved up one week from January 8 to January 1. Apparently it just dawned on The Weinstein Company that most Americans—outside of retail workers and those in the service industry—have New Year’s Day off, and will probably be looking for something to do. Might as well see a gory Western at the local AMC. Bring the kids. According to Deadline, the decision was made after positive word-of-mouth from recent press screenings of the film. (The original plan of a later, wider release of Quentin Tarantino’s latest epic was presumably made to avoid the box office juggernaut of Alvin And The Chipmunks: The Road Chip.) The 70mm roadshow version of the film—featuring a slightly longer cut, an overture, and an intermission—will still hit screens nationwide on Christmas Day.